Every living thing on Earth needs water to survive. Fortunately, Mother Nature’s got a pretty smart way of recycling water – the water cycle. 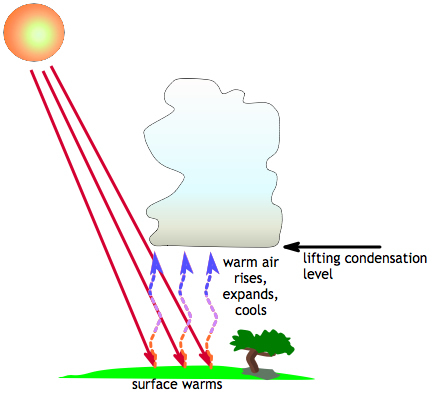 The sun turns water on the Earth into a vapor. Water comes from the ocean, lakes, rivers and streams. It also comes from plants, trees and the ground. This is called transpiration. As the vapor rises, it gets cold. When it gets cold, it gathers in clouds. This is called condensation. When the clouds get too heavy to hold the water any longer, they drop it back to Earth in the form of rain, sleet, snow or hail. Some of the water runs into lakes, streams, rivers and oceans. Some of it soaks deep into the ground, creating underground aquifers. When someone digs a well, they are tapping into an underground aquifer to find water for drinking. Ground water is water that soaks into the ground. Eventually some of it travels to the ocean, picking up salt and other minerals on its way. This is why the ocean is salty. Water trapped in glaciers and ice caps can be millions of years old. It is the purest water on Earth. Bill Nye the Science Guy explains all about the water cycle and how it works. Question: If most rain comes from ocean water that’s turned to vapor, why isn’t it salty? Answer: Good question! When water in the ocean becomes a vapor, the salt is left behind. Enjoyed the Easy Earth Science for Kids Website all about the Water Cycle info? Take the FREE & fun Water Cycle quiz and download FREE Water Cycle worksheet for kids. For lengthy info click here. Declan, Tobin. " Fun Water Cycle Facts for Kids ." Easy Science for Kids, Apr 2019. Web. 23 Apr 2019. 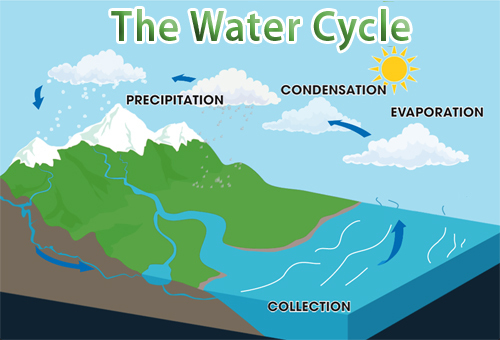 < https://easyscienceforkids.com/all-about-the-water-cycle/ >.